One of the best-known forms of spiritual magic is that of working through a doll to represent a person- A Voodoo Doll. Legends and superstition connected with voodoo dolls is varied and the rituals are a widely-disputed matter. When people think of the word voodoo doll, they always associate the term with an act of intent driven by hate to seek revenge and harm. But there is a hidden art of practice most folks would not think probable and that is the use of a voodoo doll to cast a spell for love, success, luck, health, or protection. The origin use of voodoo dolls was narrowed down to only a few practitioners from ancient Africa but with time became a diverse art of practice around the globe. Any doll used should be tagged with the name of the person it is to represent, and add some item belonging to that person such as a piece of clothing, hair cuttings, a photograph, or fingernail clippings. 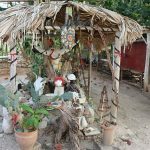 In addition, oils, herbs, spices, minerals, stones and other elements are incorporated into the voodoo doll to enhance the spell being attempted. Now that we know there are many other uses for a voodoo doll other than the misconception of misfortune, given this knowledge it is still recommended to do further research. As previously stated, the use of this art has been widely disputed and there are many difference types of spells that require attention to detail. To understand how a voodoo doll works, you will need to know its history and how it came about. A Voodoo doll originates from Voodoo, a very spiritual Religion with roots as old as Africa and with millions of followers today. Voodoo originated in the West Indies country of Haiti during the French Colonial Period. The foundations of voodoo are the tribal religions of West Africa, brought to Haiti by slaves in the 17th century. The slaves captured where mainly from the kingdom of Dahomey, but they also came from many other tribes throughout West Africa. The word voodoo or “vodu” in the Fon language of Dahomey means “spirit”, ‘god’. Haiti being isolated during this point in time, allowed the new coming slaves from the many tribes to create a new religion based on the common core beliefs. These beliefs consisted of worship to the spirits of family ancestors; the use of singing, drumming and dancing in religious rituals; and the belief the followers were possessed by immortal spirits. They also absorbed and adopted each tribes’ strongest traditions and Gods. For many of the enslaved Africans such traditions and spiritual practices provided them a vital means of mental and emotional resistance to the hardships of living in captive. During this time, it is known that slaves started to use the voodoo doll as a secret tool for protection and casting of spells against their owners for such cruel treatment and captivity. They also use voodoo dolls to communicate and seek guidance from the Loa. The Loa are spiritual Gods, messengers of the creator, and the ancestors and spirits of family members who have passed on to the spirit world. Voodooists pray to the Loa. But they are not simply prayed to, they are also served. A special offering or sacrifice can be made to the Loa in return for a petition or request. As it is known for a voodoo doll to be used as an instrument to address the spirit of a person which a spell will be cast upon, it is the Loa that is summoned to help cast the spell. The unknown can bring fear and misconception to any individual. But being fully knowledgeable can drastically change that. A new form of respect grows and out goes the idea of a voodoo doll being a force of complete evil and malice. In the end, it all depends on the intent of the individual, but rest assure that whatever that intent might be, there is still mystery and superstition surrounding this spiritual form of art. Cleansing, spell bad luck, failer, blockage, breakthrough, business, money.